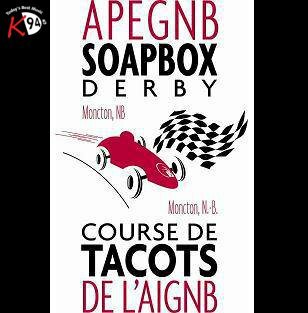 K94.5 is a proud sponsor of the 8th annual APEGNB Soapbox Derby happening Sunday, September 23rd from 9:30am – 3pm (on St. George Blvd between Dickson and the fire station on Milner)! Participants as young as 7 years old can take part in the Non-Official Wheels, Official Wheels or Open Category! Participation is free so get involved and build your own Soapbox as a family! Contact them on Facebook or at SoapboxMonctonTacots@gmail.com for more info and to register. The Association of Professional Engineers & Geoscientists NB Moncton Branch & the City of Moncton are proud to host the 8th annual event.